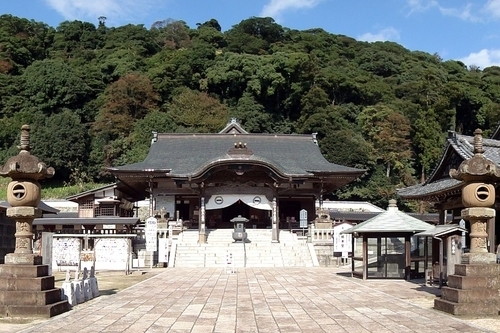 Ichibata-ji (temple) is located at an altitude of 200m on the mountain, Ichihata-san. It’s located in the center of Shimane Peninsula which is known for being the setting of the myth depicting the origin of Izumo, the ‘Kunibiki’ (Land-Pulling). According to the temple’s history, it was founded during the Heian Period in the year 894 as part of the Tendai sect of Buddhism. According to legend, the origin for this area being enshrined derives from when a statue of Honzon-Yakushi Nyourai was scooped up out of Aka-ura by a fisherman called Yoichi (who later took the name Honen upon entering the Buddhist priesthood). Ichibata has come to be considered as a location for ‘Kechigan’ (Thanks upon the completion of a pilgrimage) As Yakushi is known for being an ‘eye healer’, this temple is often visited as part of the Bay Pilgrimage to either give thanks for recovery from serious eye disease, or to pray for help from such illnesses. It’s said that those suffering from eye problems make their way up to Ichibata Yakushi with the aid of one stick and bring offerings of seaweed and water drawn from various bays using the ‘Shiokumi’ process before asking for help. Regarding the Shiokumi tide drawing and offering from Aka-ura, it’s said that the shellfish "Bebe" had fallen to eyes of Ichibata when he was in the seabed . (Investigation report by Ms. Kiyoko Segawa) This miraculous legend regarding the appearance of Yakushi and the connection with eyes could be the origin of the offering of tide water and seaweed. In the ‘Unshu 42 Bay Pilgrim Song’ book from the middle of the Edo period, there are numerous references to shrines highlighting the strong connection to Shintoism. On the other hand, the connection between the 42 Bay Pilgrimage and Yakushi can be confirmed back to the end of the Bakufu. The Ichibata Yakushi sect has developed significantly since the end of the Edo Period. It’s likely that the increased interest in the legend of Yakushi and the connection to the healing of eye disorders is one reason why numbers attending the Bay pilgrimage have increased. 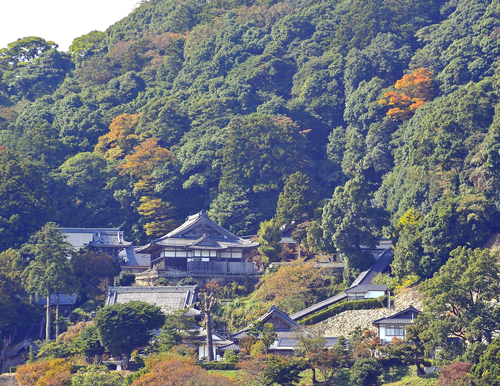 The way to Ichibata Yakushi is by first taking the highway that runs along the mountain ridge, then coming off at the crossroads and following the road that used to be a railway line which will finally take you to the 1200 stone steps that lead to the temple. Halfway along these stones steps, you’ll come across a miniature bronze statue depicting one of the ghostly apparitions made famous by the manga artist Mizugi Shigeru.Within the Ichibata grounds near the temple dedicated to Kannon is a large bronze statue depicting the young boy and the ex maid Kageyama Fusako when they visited the temple from Mizugi’s famous story ‘Nononba to Ore’. Moreover, as Ichibata is known for its connection to healing those with eye conditions, there is always a steady stream of worshippers. Votive offerings of seawater drawn during the 42 Bay pilgrimage can be found placed nearby the main hall of the temple. Following support from the All Japan Ceremonial Assistance Organization, our research group was granted aid to put up information boards at all spots on the pilgrimage and on November 24th 2012, the information board for Ichibata was unveiled here. Although the 42 Bay pilgrimage is a personal religious faith performed since long ago, it isn’t part of the Ichibata ceremonies. However, there is an area used for Buddhist worship available for 42 Bay pilgrims too. This area also sells guide books for both the 42 Bay and the 7 Bay Pilgrimages.